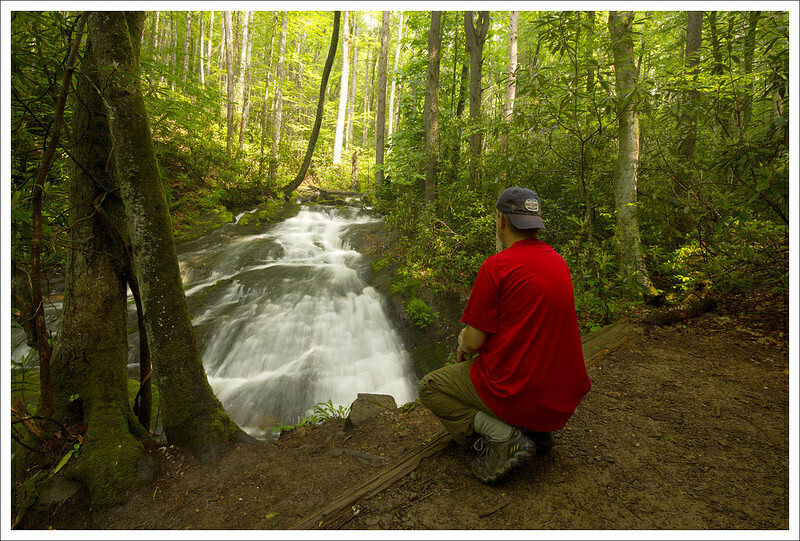 This 4 mile out-and-back is an easy hike to one of the Smokies’ lesser visited and under-appreciated waterfalls. 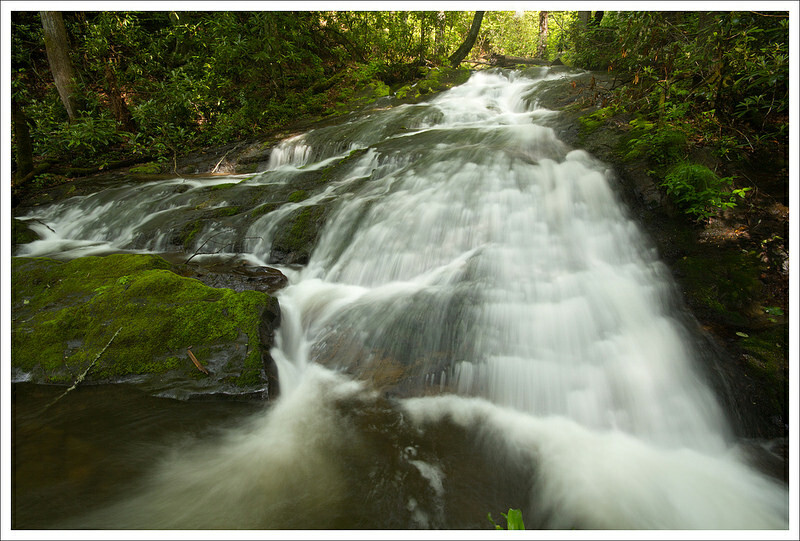 The walk begins from the Smokemont Campground and follows a lovely stream and eventually reaches a pretty 25′ waterfall. Pretty Chasteen Creek Cascade spills from the forest into a small pool below. 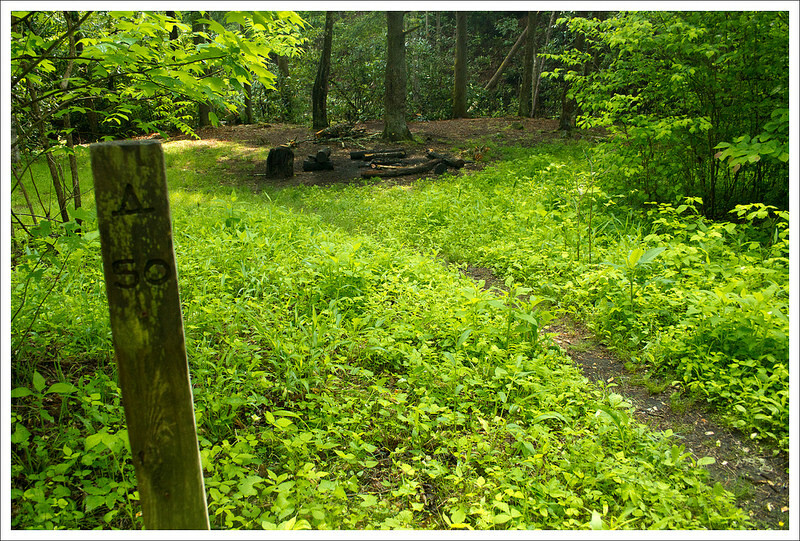 Below: The trailhead at the end of Smokemont Campground. 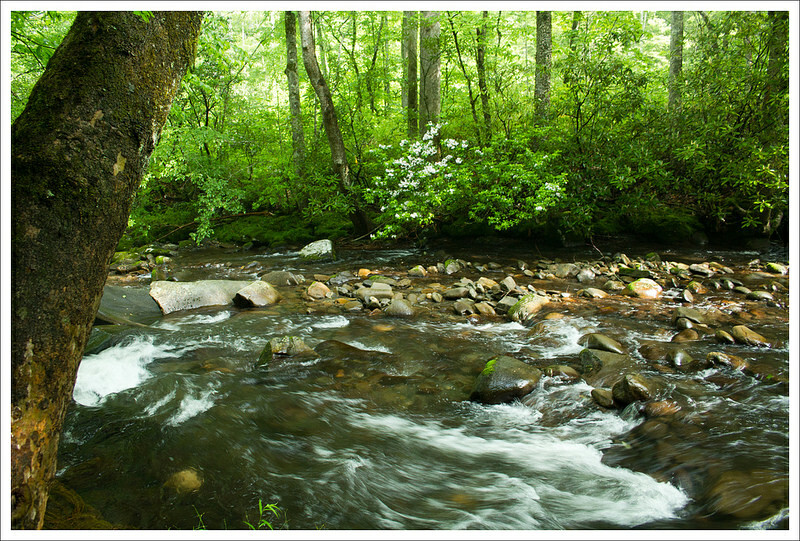 Adam tucked his pant legs in to avoid ticks; Mountain laurel along Bradley Fork; The trail is an old logging road. For the first few days of our trip, I wasn’t feeling great. Even after easy hiking days on Mt. Pisgah and Wesser Bald, I still wasn’t myself. Mentally, I had big hiking plans for every day of our trip, but in the end, my body dictated that we hike shorter, less strenuous trails. On our second day in Bryson City, we woke up to lightning, rumbling thunder and torrential downpours. The local weather said that the heavy rain would clear out and leave us with a hazy, mostly cloudy, unsettled day. We decided that an easy waterfall hike would be perfect for those conditions. After breakfast at Mountain Perks (probably my favorite breakfast spot in Bryson City), we drove into the park. Our hike started at the far end (section D) of the Smokemont Campground. For the first 1.2 miles, we followed the Bradley Fork Trail. It went gently uphill along the stream. The morning rain paired with the emerging sun made for a hot, muggy and buggy hike! Whenever we stopped for photos or to take in the scenery, we were swarmed by gnats and mosquitoes. 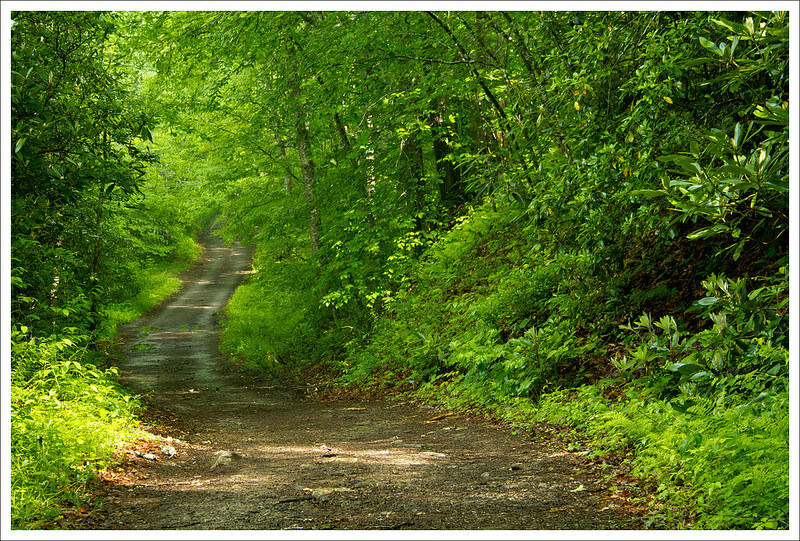 Nonetheless, the trail was beautiful – so lush and green. Adam Enjoys the Bradley Fork. 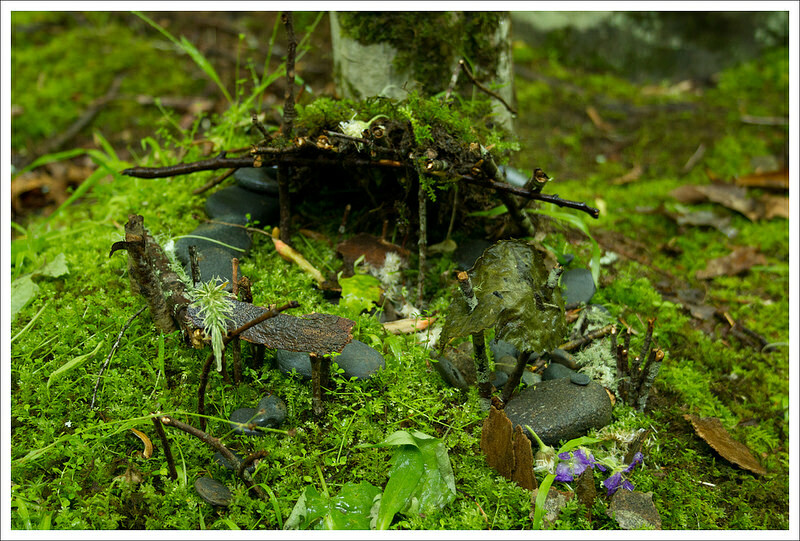 Below: A marker for the Benton MacKaye trail along the shared portion of the hike; Someone built a ‘fairy house’ along the Bradley Fork; Trail junction with Chasteen Creek Trail; Campsite 50. The trail along Bradley Creek is popular with horseback riders. In fact, the National Park Service concessionaire offers a trail ride from Smokemont Stables to the waterfall. I bet it’s a wonderful, scenic ride! 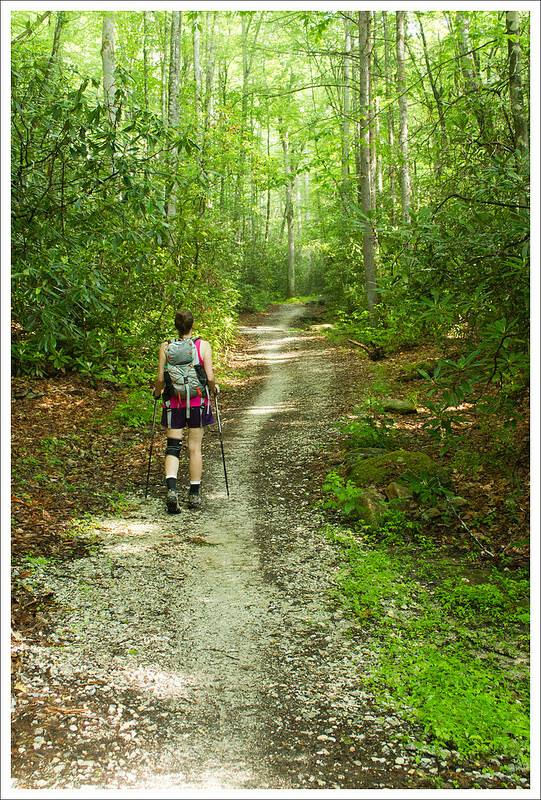 The trail is also shared with the Benton MacKaye Trail – a 300 mile trail across the southern Appalachians. 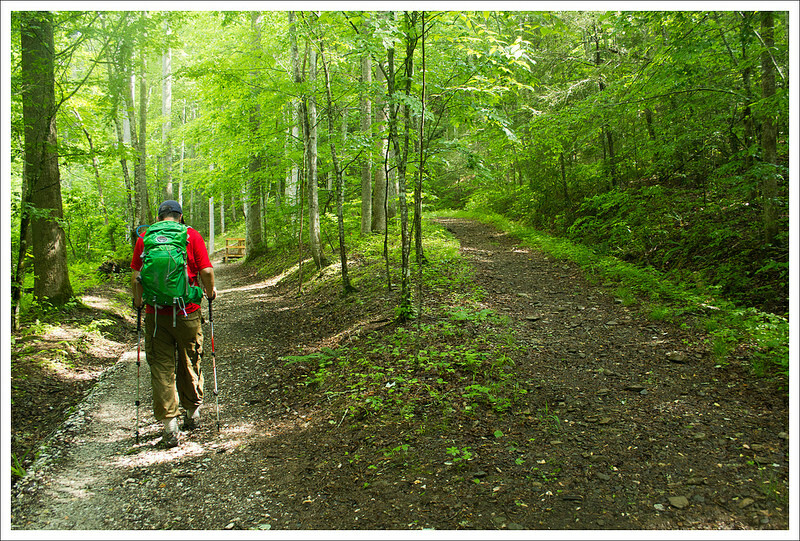 Almost 100 miles of the Benton MacKaye Trail passes through the Smokies. 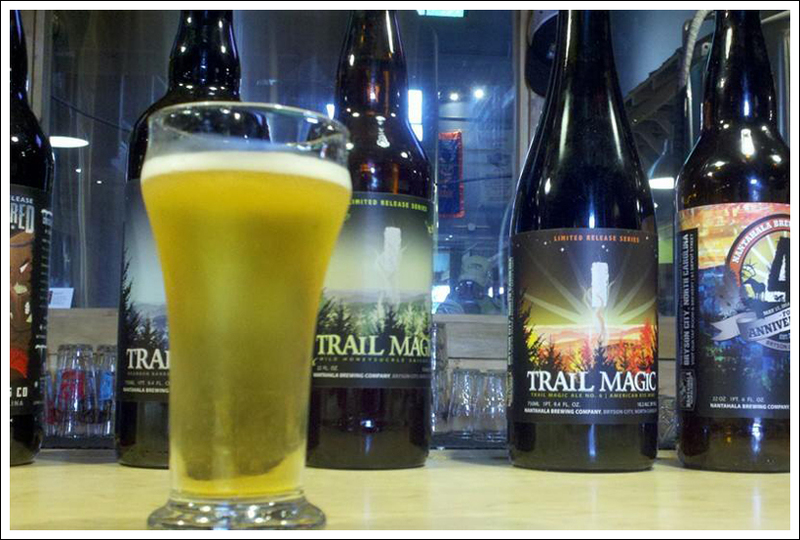 MacKaye, a forester from Massachusetts, is noteworthy because he came up with the idea for the Appalachian Trail… what a legacy to leave behind! 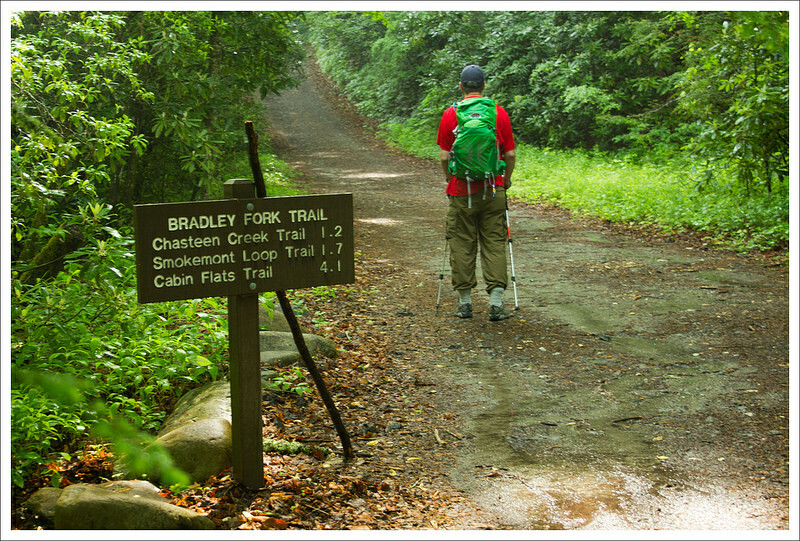 At 1.2 miles, the Bradley Fork Trail intersects with the Chasteen Creek Trail. At this junction, take a right and follow the trail toward Chasteen Creek. Almost immediately, on the right, you’ll pass Backcountry Campsite 50. It’s a pretty streamside spot with a fire ring and bear cables. The campsite can only be used if you have secured a paid permit. Evidently, permits in the Smokies can be hard to come by, so plan early! After the campsite, walk another half mile along the Chasteen Creek Trail. Shortly after crossing a footbridge, you’ll come to a split in the trail. On the left side of the split, you should be able to see a hitching rail and mounting step for horseback riders – go in this direction. From the clearing for horses, you’ll see a narrow footpath following the creek. In just about a tenth of a mile, you’ll come out at Chasteen Creek Cascade. It’s about a 25 foot waterfall. It’s not the kind of waterfall that plunges dramatically; rather it slides over the rocks into a pretty pool below. We had the waterfall all to ourselves and enjoyed the spot for about twenty minutes. Afterwards, we headed back the way we came and back into Bryson City for lunch at the Bar-B-Que Wagon. They have great Carolina-style barbecue with all the expected sides. Christine walks along the Chasteen Creek Trail. 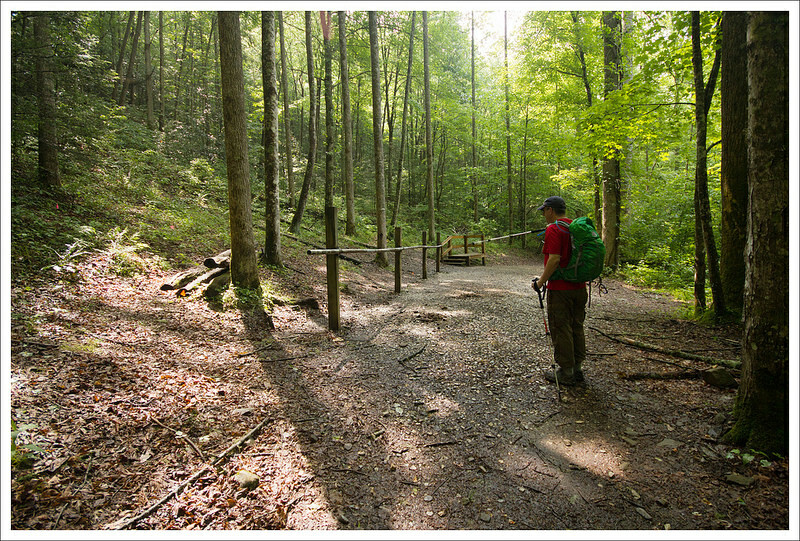 Below: The split in the trail that leads to the falls; Hitching post and mounting block; Adam at the falls. 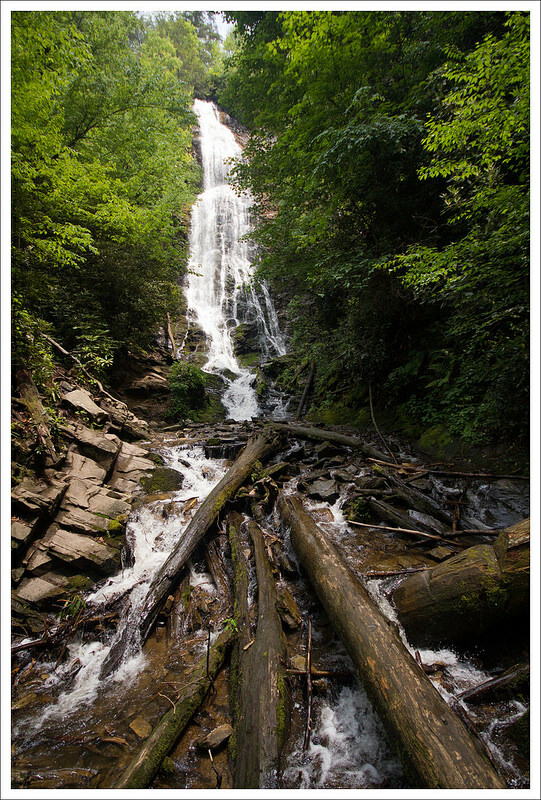 When we talk to people about the Smokies, they seem to be surprised that some of the best highlights of the park are the waterfalls. In talking with the locals of the area, April and May tend to be very rainy seasons for the area. Storms move in and out quickly through the park, but they typically expect a little rain most days during this season. Rainy days are prime days for waterfall viewing and photography. We started off our hike from the Smokemont Campground in the D section of the campground. In the winter, this may be blocked off and you may have to park and leave from the C section. 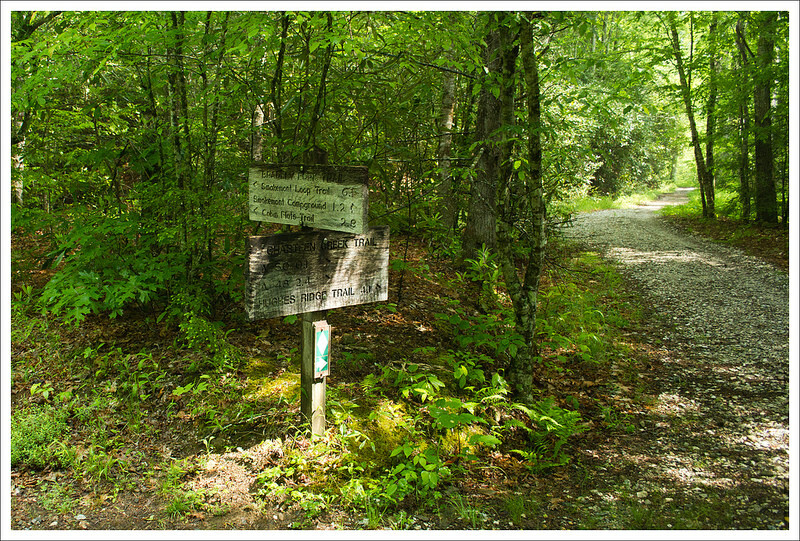 The trailhead starts from a large gate near the designated parking area at the end of the campground. We doused ourselves with bug spray and moved on. 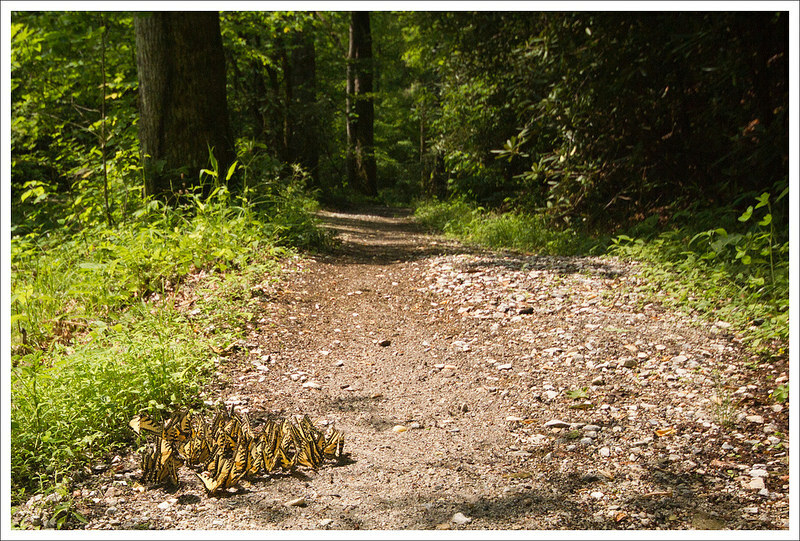 We saw a swarm of butterflies on the trail. Below: After lunch, we visited impressive Mingo Falls. It’s probably the tallest waterfall in the area; Nantahala Brewing Company and Anthony’s Pizza were the perfect way to end our time in Bryson City. The trail was gradually uphill, but it mostly felt flat. In fact, we were surprised to see the elevation gain on the hike afterwards. The trail started off on a gravel road alongside Bradley Fork. The forest was lush with green from all of the rain, so it was a pleasant stroll through the woods. Because of the width of the trail, Christine and I could also walk side-by-side along the trail. At 1.1 miles, we crossed a large footbridge and at 1.2 miles we came to the intersection with the Chasteen Creek Trail. We took a right there and continued to walk on a wider trail, passing Campsite 50 at 1.3 miles. At 1.9 miles, we reached the side trail to the left with the horse hitching area. It was a short walk to get to the waterfall from there. We headed back the way we came for an easy, scenic hike. If you wanted to make this a longer hike, after you visit the waterfall, return back the way you came. 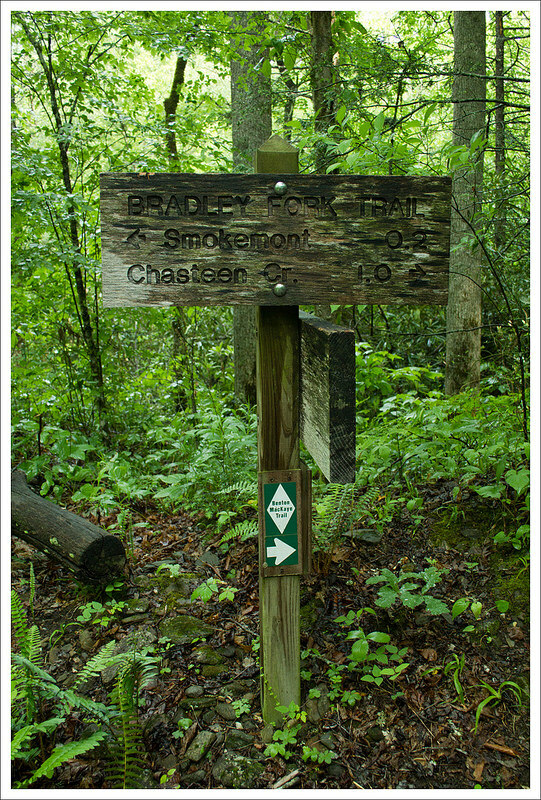 You could take a right at the junction with the Bradley Fork trail and connect to the Smokemont Loop Trail. This would make the grand total of distance about 8 miles, but would loop back to a different section of the campground. You may see people fishing for rainbow trout along the Bradley Fork or Chasteen Creek. 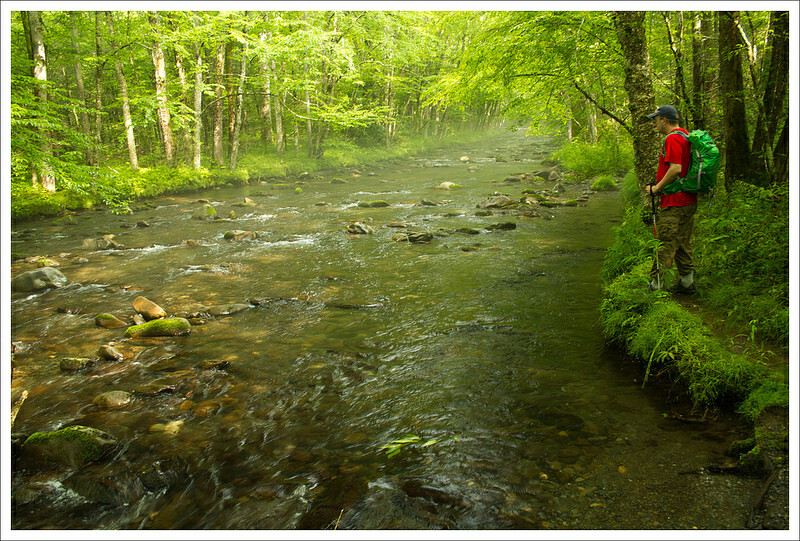 I can imagine many campers at the Smokemont Campground spend some time fishing in hopes of cooking some fish from the water. After the hike, we had lunch then headed into Cherokee to check out the Qualla Arts & Crafts Mutual. Their traditional work is fascinating and beautiful. We always enjoy visiting. After that, we stayed on the reservation and visited Mingo Falls, one of the tallest and most impressive waterfalls in the Appalachians. It was a short walk, but there were many stairs! 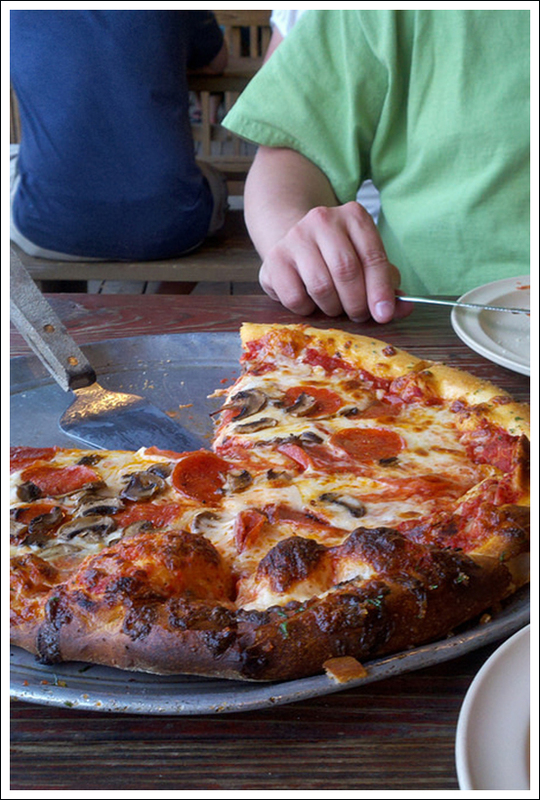 Our wrap up for the day was a visit to Nantahala Brewery followed by pizza from Anthony’s. We consider those two stops to be ‘must-do’ in Bryson City! On to Gatlinburg tomorrow! Elevation Change – 490 ft. Difficulty – 1.5. This is an easy walk along a very gently graded trail. Trail Conditions – 4.5. The trail is mostly wide and road-like. It’s only narrow and muddy at the base of the falls. Streams/Waterfalls – 4.5. Bradley Fork, Chasteen Creek and the falls are all beautiful! Wildlife – 3. We didn’t see anything, but the Smokies have wildlife everywhere! Ease to Navigate – 3.5. The trail is easy to follow if you read the junction markers. The shared/intersecting trails might be confusing if you’re not paying attention. Solitude – 3. Chasteen Creek Falls is not one of the park’s more popular trails. You may see horses and occasional hikers from the campground, but generally this trail has less foot traffic than many others. Directions to trailhead: From Newfound Gap Road (Route 441), follow signs to Smokemont Campground. The campground is located 3.5 miles north of the Oconaluftee Visitor Center and 26 miles south of the Sugarlands Visitor Center. Park in the hiker parking area at the end of section D of the campground.